There's a fun new food concept coming to Westboro this month with the opening of Fiazza Fresh Fired's second location. 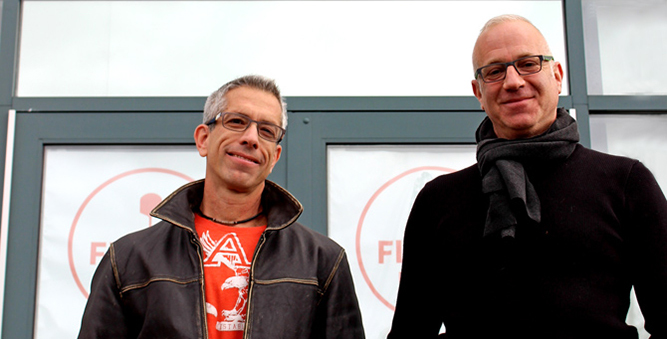 An Ottawa-based casual dining restaurant that emphasizes full flavour and fast service, Fiazza's success in the ByWard Market has convinced co-owners David Sugarman and Steve Lesh, along with general manager Ashley Cannon, that the time is perfect to expand. "Additional locations were always part of the plan, and we have had our eye on Westboro since even before we opened our first spot. It was all about finding the right space," explains David. "We wanted to open our second restaurant in an area that we felt was underserved in terms of the type of product that we offer." The Fiazza concept centres around thin crust pizzas made fresh right before your eyes and cooked in mere moments thanks to an imported Woodstone oven, fueled by highly pressurized natural gas. "The oven is key; it gives us consistent heat plus it's very energy efficient," notes Steve. "We think being able to serve up delicious food, prepared from scratch, in minutes is a big part of our appeal. Everyone's busy but they still want to eat food that tastes terrific and is made from top quality ingredients." The Fiazza pizza menu includes a range of pizzas plus lots of customization options. Vegetarian and vegan options are no afterthought and there is also a gluten-free crust available. The range of toppings is impressive and includes nods to some of the best local food purveyors in the region including Luciano's sausage, Marcello's vegan pesto and Alfredo sauce from Les Fougeres. Made fresh to order salads and a selection of desserts round out the food offerings. Beverage selections include coffee, local soda, hyperlocal craft beer as well as wines from both Italy and the Niagara region. The décor of Fiazza complements the food, extending the fresh vibe in an atmosphere that is casual, comfortable and contemporary. "This location will be more intimate than ByWard, with great sightlines of the kitchen throughout the space. We've put the oven front and centre because it serves as a fun focal point for everyone," says David. With catering and delivery available, Fiazza fare may soon be popping up in dining rooms and boardroom tables throughout Kitchissippi. Come summer, their licensed patio on the corner of McRae and Richmond Road is sure to be a popular spot. Native Ottawans, both owners look forward to spending more time in one of their favourite neighbourhoods. "We really like this area, for its central location and the fact that it is a friendly community and very family-focused," confirms Steve. "With our emphasis on top-notch service we think that Fiazza will be a great destination for pizza lovers of any age, especially busy families who will especially appreciate how fast their pizzas will be prepared." A shared passion for pizza is not the only thing that David and Steve - who have been best friends for over fifty years - have in common. They have both infused their genial warmth into the culture of Fiazza, something that Kitchissippi patrons are sure to find reflected in both the atmosphere and service. In an area that is not without other pizza options, David and Steve are confident Fiazza will win the hearts - and stomachs - of the community. "It has been great to feel so welcomed by the neighbourhood," says David. "As we've been working to get the space ready, people have been coming in the door, eager to find out when we are opening. We can't wait to start serving up our fast, fresh food here." 21 Pizzas in Canada you have to eat before you die!